Most true entrepreneurs are dreamers, hustlers and some might say visionaries. They see the world differently, constantly look for new ideas and find innovation kind of a hobby. The also drive people that work for them a little crazy. Working for an entrepreneur is a little like driving down the highway about 6o miles and hour with no steering wheel. What every wildly successful entrepreneur has found, either by accident or crisis, is that they need a yin to their yang – or what Gino Wickman and Mark Winters call an Integrator. An Integrator is that person that knows how to implement the plan, lead the troops and hold everyone accountable for achieving the stated business plan objectives – including the entrepreneur. The Integrator is a bit like an operations manager on steroids. Sure they naturally handle a great deal of the operations kind of stuff, but their real role is arbitrator, communicator and referee. 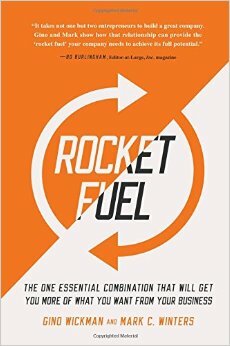 My guest on this week’s episode of the Duct Tape Marketing Podcast is Mark Winters, co-author of the book Rocket Fuel: The One Essential Combination That Will Get You More of What You Want from Your Business. We discuss his new book and more about the dynamics of Entrepreneur Operating Systems. The simple, yet brilliant approach of the Visionary and Integrator is the missing piece for most businesses. How does a visionary find the perfect integrator for their business? How does the relationship between visionary and integrators work?